Full Operations have now commenced at our facility at the Aviation Technology Park. 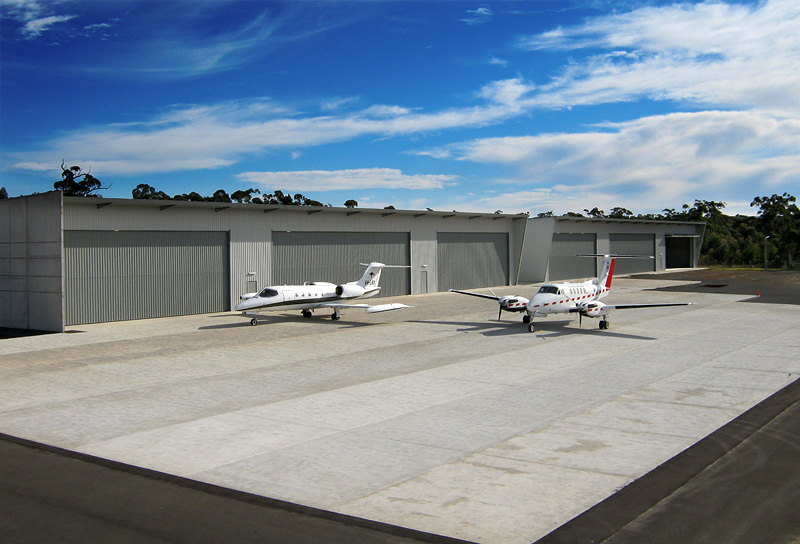 Both hangars are now fully operational with one for the Pelair Jet Services Contract and one for the Air Affairs Test Flight Centre and Aircraft Maintenance. Workshop 1 is in full operation for our Electrical workshop, Stores , Rescue Hoist and Product Assembly areas. Our administration offices are also in full operation from Technology Park. Workshop 2 is operational and work will commence in the new year on the final Hangar. Full Flight Operations are underway at our new facility at Technology Park. 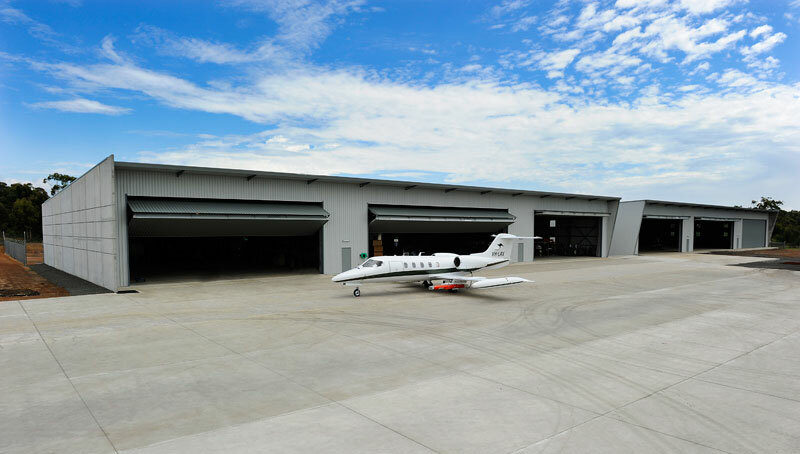 Both hangars are now fully operational with one for the Pelair Jet Services Contract and one for the Air Affairs Test Flight Centre and Maintenance Facility. Workshop 1 is going through the final stages of the internal fit out and will be operational in the next few months. Full Flight Operations are underway at our new facility at Technology Park. 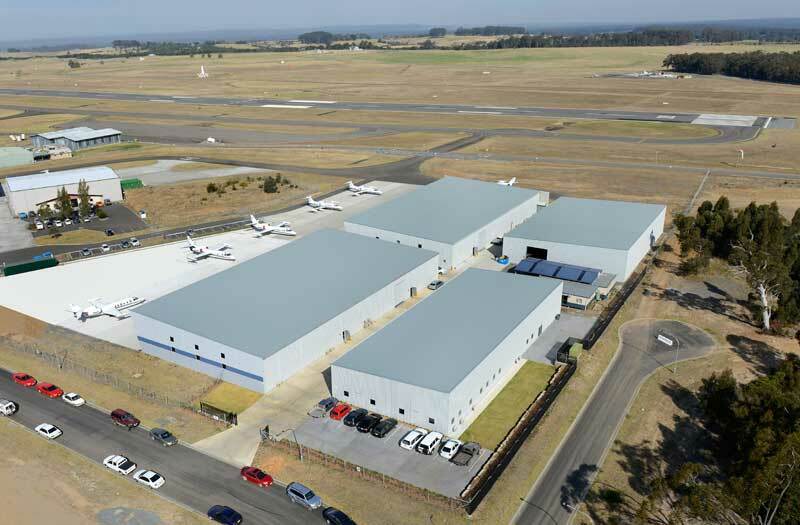 Both hangars are now fully operational with one for the Pelair Jet Services Contract and one for the Air Affairs Test Flight Centre and Maintenance Facility. Workshop 1 will be commissioned early in the New Year. 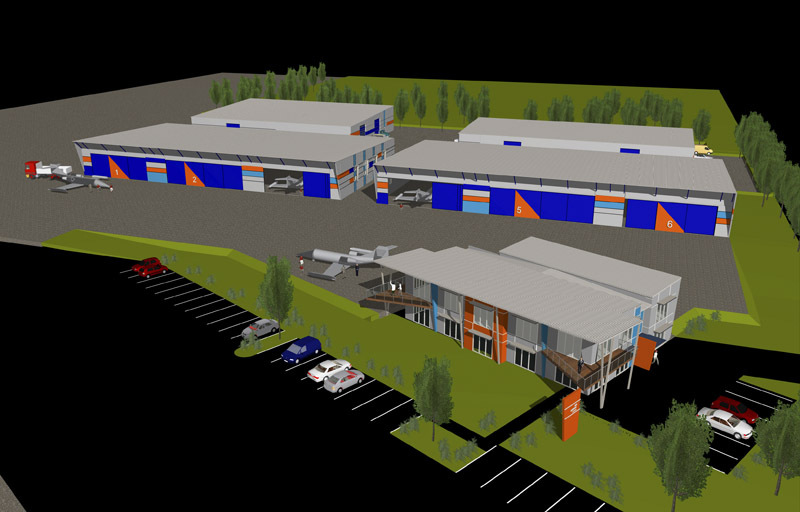 Work is continuing on our new facility at the Technology Park Nowra. Click here to view images of the construction progress of our new facility. Stage 1 (Hangars) of the new facility commenced in November 2009 and is progressing with completion expected by April this year. Stage 2 (Hangars) has also commenced and should be completed by mid year and this will complete the hangar portion of the development. The Air Affairs line scanning aircraft "firescan 255" has been kept very busy with a large number of bushfires in NSW since October last year. Below is a sample of some of the imagery being sent to the ground from the aircraft. During the afternoon of the 14th October, 2009, a bushfire ignited during hot temperatures and extreme hot winds on the north coast of NSW. Into the evening, the fire was threatening the coastal community of Brooms Head. The Line Scanner aircraft was used to accurately plot the fire’s position, during the darkness and dense smoke. This image was taken at 20,000 feet. This image is 2 days later from the same fire in the first image. The line scanner was used on consecutive days to monitor out of control fire fronts and offensive back burning efforts. The fire fighting efforts were hampered by varying strong winds over the first few days. This image clearly displaying the effects of the winds on the directions and rate of spread of the fire over the initial 2 day period. 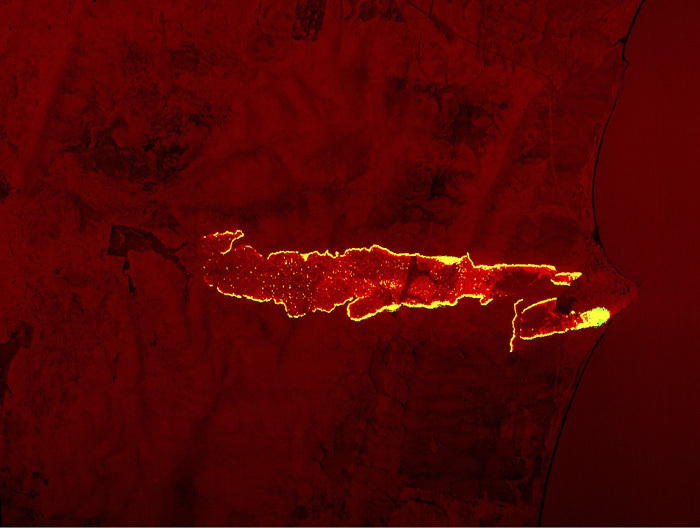 Through dense smoke and minimal visibility, the line scan image clearly shows active uncontrolled fire fronts on the western and southern areas. 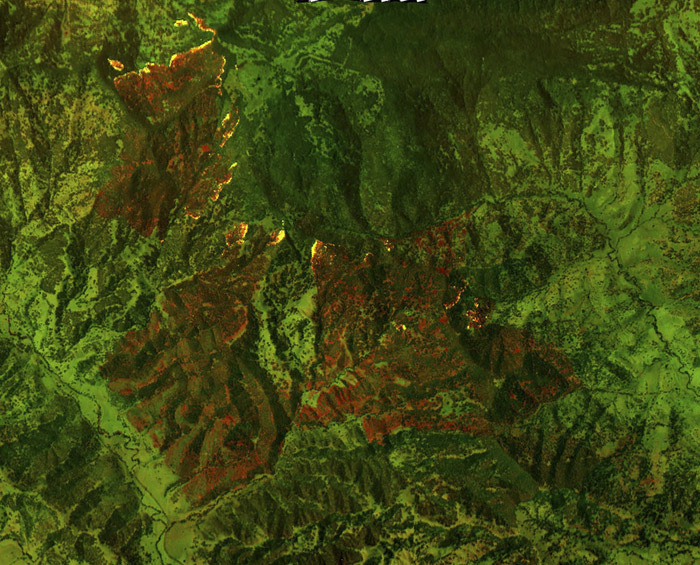 Back burn lines of fire are also clearly seen on the northern area of the image. The daytime image defining active fire front intensity, whilst providing valuable information on prior burnt areas. This image was taken at 20,000 feet. A daytime image of a large bushfire in Northern NSW, on 13th December, 2009. The fire had been burning in accessible country for over a week. Due to the large area and conventional visual spotting techniques being limited by dense smoke, the Line Scanner was used frequently to monitor the fires progress. 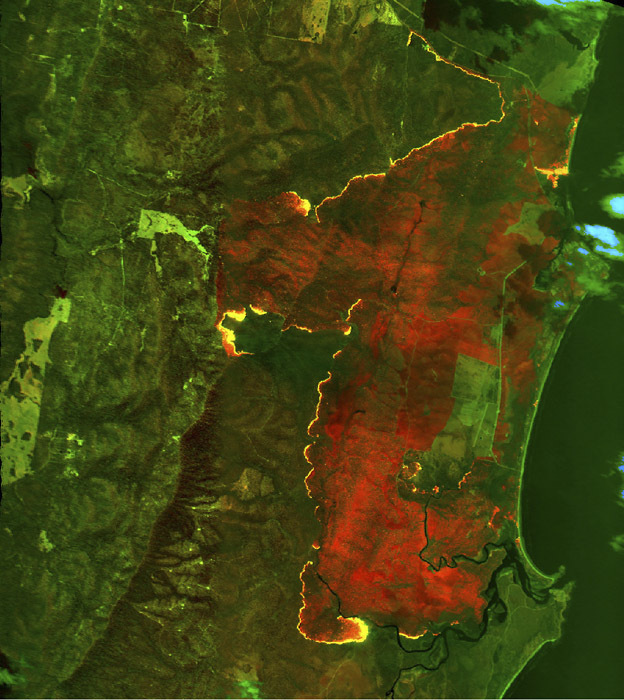 The daytime image clearly showing active fire fronts, fire spotting and defined areas of prior burning. Extensive terrain detail is also seen including topography, vegetation cover, creeks and roads. The single image providing a vast quantity of information to assist ground and air fire-fighting efforts. This image was taken at 26,000 feet. Air Affairs has a special mission Learjet 35A available for charter. It has hard points and a large variety of special wiring including Ethernet from the cabin to the wing stations, UHF Radio and a 4 station intercom. It also has internal equipment consoles for computers, video monitoring, recorders, target command and control transceivers and reeling machine operations. There are extra antenna’s available for telemetry and communications and also has a camera door available for high altitude aerial photography or line scanning. Air Affairs Australia is proud to announce the release of the most affordable target drone in the 200-300 knot performance range today. Until now piston engine drones have dominated the market, mainly because of price and because jet powered drones have traditionally been expensive and short on endurance. The Phoenix Jet currently provides performance 100-150 knots faster than equivalent piston engine drones for almost the same price, whilst at the same time, displaying flying capabilities only available from sophisticated and much more expensive drones. The cost of consumables with Phoenix is virtually zero. It uses an onboard engine driven smoke system to provide visual recognition equal or superior to the traditional smoke generators as used on other target drones. Smoke generators are expensive to purchase and are becoming extremely difficult and costly to transport. The Jet engine also provides an infrared signature for heat seeking missiles and IR fused rounds. Typical endurance is 60 minutes, however 2 hours is available from the long-range version at an average speed of 200 knots. The autopilot used in the Phoenix Jet is the UAV Navigation AP04, a rugged and compact unit that provides unmatched performance and versatility compared to other systems. The AP04 is a complete autopilot that includes sensors (accelerometers, gyroscopes, magnetometers and both static and dynamic pressures) a GPS, dual redundant 32 bit processors, an interface to control servos and other peripherals and a long-range radio link. The AP04 has 16 functional IO ports, each of these can be programmed to drive flight controls with others performing payload control functions, such as smoke and flare activation and parachute deployment. The autopilot also has the ability to drive and control a stabilised camera platform. All functions of the camera platform are through the GCS02 ground station general user interface as is the ability to control a GPS controlled high gain tracking antenna. All the necessary Ground Support Equipment is manufactured in house and existing catapult launcher systems can be adapted with a the addition of a new drone shuttle. The drone system is designed to be simple to operate and incorporates standard features for auto launch, full autonomous flight and parachute recovery. An important factor to achieve the performance and lightweight of the Phoenix Jet has been the use and selection of modern composite materials and manufacturing techniques. This aircraft is significantly stronger than similar sized drones and can achieve high G turns and drone saving manoeuvres to meet the needs and requirements of today’s users. Careful selection of components and the latest flight control system have enabled the Phoenix Jet to meet and in many cases exceed the original design expectations. 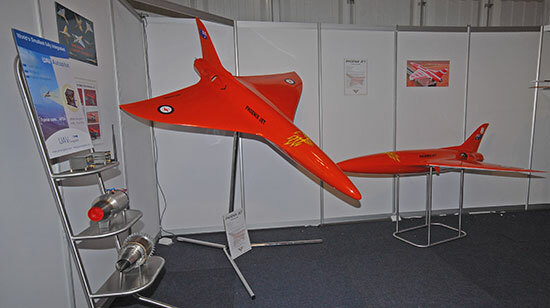 Air Affairs Australia is committed to further developing the Phoenix Jet to eventually equal the low end performance of much more expensive high speed target drones. 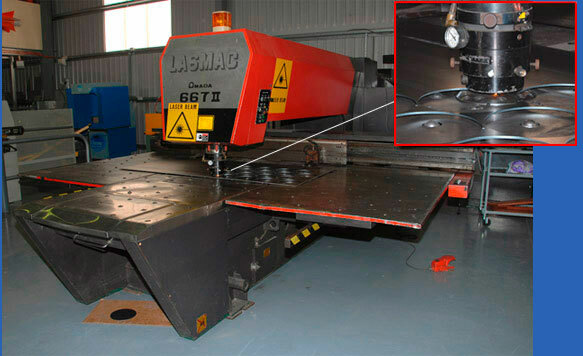 We have just commissioned an Amada Laser Cutting Machine which will enable us to profile cut a large range of shapes and different materials. Previously this work has been sub contracted but now we have the ability to carry out this work in-house. This enhances our present capability and both existing customers and other businesses in the area have shown interest in us completing this work from now on.